Visitors to Tempe Town Lake can experience a small storm, even when the weather is sunny and warm. 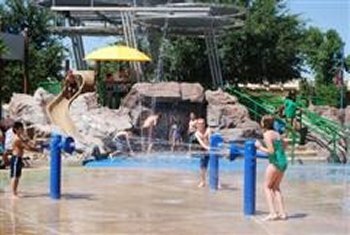 Splash Playground at Tempe Beach Park lets children cool off and have fun at Tempe Town Lake. The one-acre playground teaches how a drop of rain falls from the sky and ends up either in the ocean or becomes part of the city water supply. The entrance to the playground is a metal circle of clouds that rains a light mist of water onto visitors. Thunder claps and lightning flashes. Waterfalls turn into streams and water rushes into canals. Children can enjoy running through the ocean and riding toy whales. Only about two inches of water will pool in parts of the park. The water is kept flowing across the playground, where it is eventually collected, filtered, cleaned, and re-circulated in a state-of-the-art system. While the playground is very safeâ€”an attendant will be on-hand during operating hoursâ€”children should be watched by an adult while enjoying Splash Playground. The Splash Playground is located on the south bank of Tempe Town Lake in Tempe Beach Park. This entry was posted in Arizona and tagged Arizona, splash pad, spray park, sprayandplay, Tempe, water feature, waterplay. Bookmark the permalink.